Welcome to James Hunley's Web site. A Master class will occur the day of the concert. "Music will bring you Joy, Reflection, Peace and Hope and that you will see beauty, act with random and useful kindness and radiate love to all those you meet". It is up to each of us to change the course of our thinking and to let love overcome hate, anger, anxiety and fear. Love is the answer and music is an expression of an artists ability to love. The Hunley Guitar studio is a family of diverse people who support each other on the path of music. The studio memebers travel and have" performance get togethers" and give scholarships of various kinds to students in our Community.. It is something truly unique in this competitive world, to have such a diversity of race, religion and political views melt into a body of kind supportive people. I am honored to be a part of it and it is truly mindboggling that so many people are on the same page. I want to recomend the following 2 teachers whose students will be considered a part of the Hunley Guitar studio and join us in all the events. I think they are some of the best guitar teachers in Los Angeles. For great in home guitar lessons in Los Angeles- both, Electic and Classical contact David Paul. "One of the phrases s have used to describe the classical guitar of James Russell Hunley, the voice of love. Romance is instantaneous when he applies his technical agility to the captivating passages of the masterworks he performs. Such is the essence of the classical guitar, which may well be the most introspective of all musical instruments. It is what first attracted Mr. Hunley to the guitar, and what compels him today. 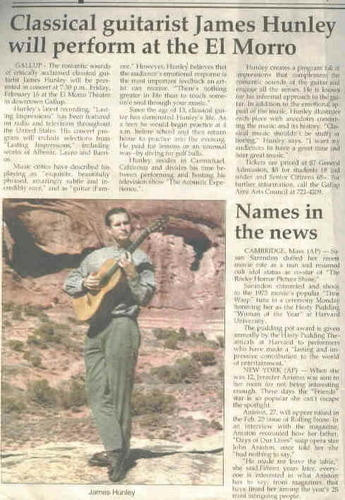 Classical guitar has dominated James Hunley's life since he was thirteen years old. Born in Chandler, Arizona to a U.S. air force fighter-test pilot and a real-estate broker, he is the only professional musician in a family of five children. As a teen-ager he was obsessed with the guitar. He would begin practice at 4 a.m. and continue practicing after school into the evening. Much to the objections of his parents he even ate dinner at his music stand. While his family was living in San Angelo Texas, the young Mr. Hunley performed in local restaurants. Several patrons took note of his performance. One patron, the Hal Noelke family was so taken by his playing that they offered to sponsor his future studies. He chose to study at the San Francisco conservatory of music. 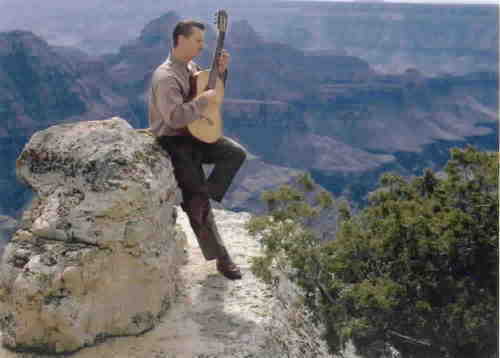 At the conservatory he gained a solid foundation in music, and the technical skills with which he could continue to explore the historic techniques of the classical guitar masters. Over the years he has woven those techniques into an individual style and interpretation. A strong affirmation of Mr. Hunleys muscianship came many years ago from California Luthier John Gilbert, whose guitars are among the most sought after in the world. The list of requests for purchasing A Gilbert guitar would take over 23 years to fill, but Mr. Hunley's playing for John secured him the opportunity to purchase a guitar after only one year on the waiting list. the U.S. television shows that both instructs and communicates the internal dialogue of acoustic music. His C.D. has been heard throughout the North American Continent. has been broadcast on, PBS, A&E and The Arts Channel in the U.S..It has been seen internationally on, Arts, from satellite galaxy one. His second solo C.D., is now in its second pressing. for him as an artist. -"nothing greater in life than to touch someone's soul through your music". An advocate for de mustifying classical music, James believes in using film and video to visually communicate the internal dialogue of music. He has served as executive producer on many classical music videos, including Pepe Romero's "Recuerdos de la Alhambra" for Phillips records. Studying, or at the opposite end of the energy spectrum, running, exercising Scuba diving and deep water snorkeling, (preferably in warm water). James Hunley has performed in the USA ,The South Pacific, Mexico, and Western Europe. He maintains two full recitals in memory and the Concierto de Aranjuez by Rodrigo.